Not all snow shovels are created equal. There are many different kinds, heights, weights, and shapes of snow shovels. It can be overwhelming when you see the wide variety of snow shovels available. Don’t worry, once it’s all broken down it’s easy to see what kind of shovel you’ll need and which will be the most comfortable for you. 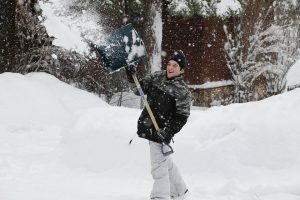 Shoveling snow doesn’t need to be a backache waiting to happen, you can find a snow shovel that suits you to prevent injury and provide the most comfort. 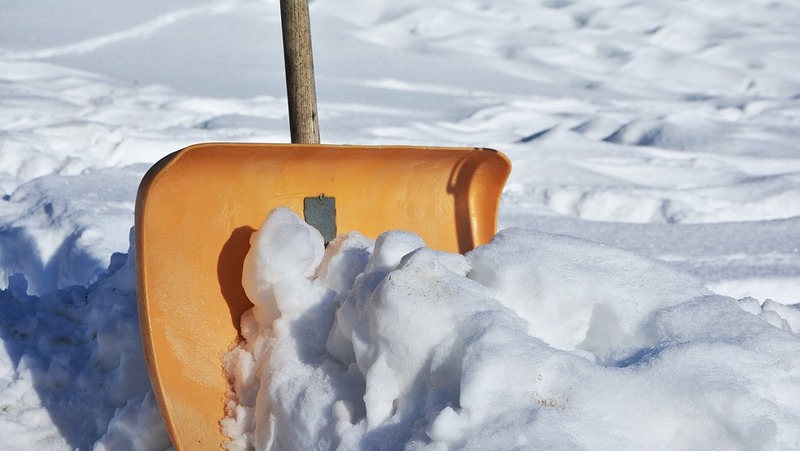 Here’s how to choose the best snow shovel for you and your needs. There are many different heights that snow shovels come in. A short person is going to have a hard time lugging about a snow shovel that goes up to their eyeballs. Hold the snow shovel up to see how tall it is. Make sure that you’d be able to shovel snow easily with the height of the snow shovel. A tall person would have an incredible backache if their shovel was too short and they had to shovel stooped over. Shop around for a snow shovel that will make your job as easy as possible. Again, you need to think about how easy or hard this will be for you. If you are a petite person, it will be really hard to carry an all metal shovel. A snow shovel that is made entirely of metal is very heavy and someone could hurt themselves if they aren’t strong enough to lift it. Likewise, a really light shovel wouldn’t be much use in a really strong person’s hands because they could handle so much more weight. Metal shovels are capable of carrying a lot of snow at a time, making the job quicker. However, you need to be able to lift the amount of snow easily so that you don’t throw your back out. Consider your strength when you’re looking for a good snow shovel. Put the handle of the snow shovel in your hands to make sure that it fits comfortably. There shouldn’t be any spots that rub or pinch. Blisters occur when the handle doesn’t fit properly. The last thing you want is blisters while you’re shoveling snow because then the shoveling job becomes infinitely harder. Each shape of a snow shovel handle is designed to do something different. You’ll need to think about what would be best for you to pick the right kind. These handles aren’t really meant for home snow removal. They aren’t heavy duty and couldn’t really carry a lot of snow at a time. However, they’re ideal for carrying in your car for emergencies. A snow shovel with folding handles is compact and is easy to fit in small spaces. Having this shovel in your trunk would be really handy if you ever got stuck in some snow. This would also be great to take on a camping trip or a hiking adventure. Dual handled shovels have two handles on them. One is straight like a regular snow shovel, while the other sort of comes out of the first. This will make hauling heavy loads of snow a lot easier because you can use both hands. Each hand would have a sturdy handle to grab onto making your grip a lot better. This means you’ll be able to lift a lot more snow at a time, just be careful that you don’t overdo it and hurt yourself. Ergonomic handles bend at a sharp angle towards you. The shovel is bringing the handle closer to you, which means you won’t need to bend down to pick up snow. This means that you’ll have significantly less back pain because there will be far less stooping than with a traditional shovel handle. People that already struggle with back pain should seriously consider getting a snow shovel with an ergonomic handle to reduce their chance of getting hurt. 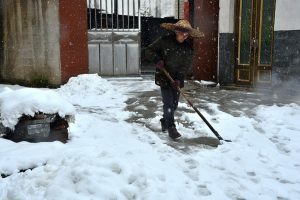 The material of the snow shovel handle will contribute to the amount of snow you can lift, and the overall weight of the shovel. A weaker material means you won't be able to lift as heavy of loads. Wood handles are lightweight and very strong. This is a good choice overall, but since wood expands and contracts with weather changes you’ll need to check it periodically to make sure that the handle is still in good shape. Typically, metal handles are made out of aluminum because they are really light. However, this also means that they can bend if they’re under a lot of pressure. Not ideal for someone that likes to carry big loads of snow. Unfortunately metal handles are also prone to rust if it is not properly cared for. You’ll need to dry the handle between each use. Plastic handles are capable of holding a great deal of weight without breaking. They are light and easy to handle (no pun intended). However, if they’re exposed to the sun for long periods of time they can become brittle and break. This means that you’ll need to put your snow shovel away after each use so that the sun doesn’t damage it. These are the most durable kinds of snow shovel handles. They won’t rust, bend, or break. However, fiberglass handles are a little heavier than some of the other options. If weight is an issue for you then you might want to choose a lighter handle. If weight is not an issue for you then fiberglass is a great choice. The actual blade of the snow shovel is very important. This is the part that will actually be scooping up snow. Do you want a sharp edge? Something heavy duty or lightweight? Consider these things when looking at snow shovel blades. The shape of the snow shovel blade will help make your job a lot easier. Of course, it depends on what you’re wanting to do. Do you want to cut through ice? Or do you just want to scoop snow aside? Flat blades are the best for cutting into hard, frozen snow. Flat blades can scrape ice off of cement better than other shapes. They’re also better at cutting through deep snow that you need to get rid of. Rounded blades are a lot easier to push. This means you’ll be able to shove or push snow out of the way quicker and easier than a flat bladed shovel. A flat bladed shovel often gets stuck on ridges in the ground. Round bladed shovels will push snow out of the way easily which makes it a good choice for sidewalks or driveways. The material of the blade is also important because it contributes to the overall weight of the shovel. Metal blades are the most durable kind of blade. They won’t break if the shovel gets snagged on something. Sometimes while you’re shoveling you’ll hit a rock, a screw, or gravel. Metal blades will be able to come in contact with those things without getting a chip in them. They’re also ideal for breaking through ice and carrying big, heavy loads of snow. That means that the entire shovel is going to be heavier, which could create strain. Plastic blades are lightweight which means you will be able to shovel at a quicker pace. However, they’re a lot weaker which means your shovel might get damaged if it hits hard ice or rocks. Snow slides off of plastic and won’t stick to it like it can with metal which might make the job quicker as well. There are snow shovels that have both metal and plastic blades. Typically, the majority of the blade is plastic which gives you a more lightweight shovel. Then there’s a metal strip along the bottom of the blade. This is ideal for cutting through ice and preventing damage to the blade. You’ll be able to cut through rock and ice, but still have the lightweight plastic blade to prevent straining. There are a lot of factors that go into choosing a snow shovel. 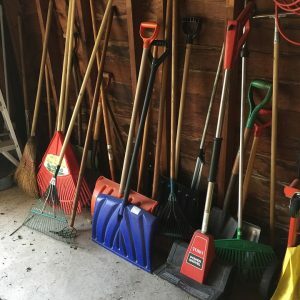 Hopefully this gave you a little bit of guidance as to how you can choose the best snow shovel for your needs. Consider the shape and material of a snow shovel before you buy it. This will save you money, time when you’re shoveling, and a lot of unneeded back pain.